Ben Stark and Frank Karsten are established forces in the Magic world. The two Hall of Famers both enter the sixth round of competition today with only a single loss. Frank Karsten is a well-known Affinity master, having piloted the deck to great success for more than a decade. 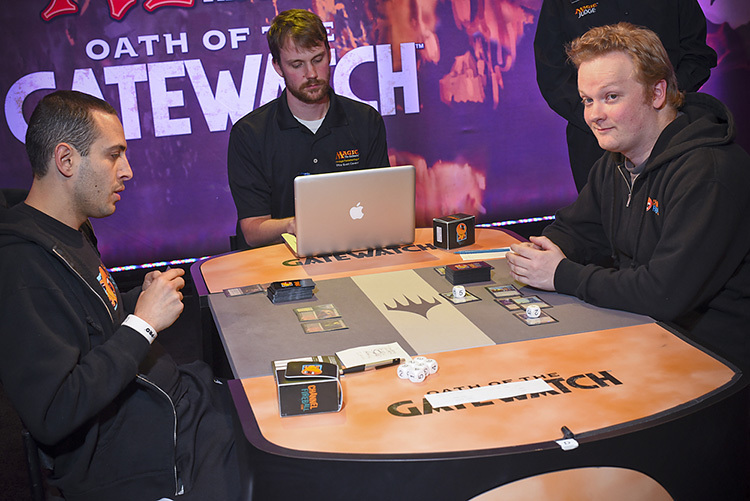 With three Pro Tour Top 8s and six Grand Prix Top 8s, it's clear that the Dutch master knows his way around some Magic cards. Karsten tested with team Cabin Crew for this event, but he pooled resources with other Affinity masters to hone in on the perfect Affinity list for the Constructed rounds. This cross team conversation is quickly being dubbed "The Secret Affinity Team" by the tournament at large. Ben Stark is a giant in terms of the game's success. Stark has four Pro Tour Top 8s, including a win, and a staggering seventeen Grand Prix Top 8s, including a win. Stark has moved away from testing houses in recent years. Instead, he prefers to play Magic Online and works with Team Ultra PRO through online conversation. Stark is always a threat and his innovative Mardu deck seems like it has the necessary tools to compete with decks that showed up this weekend. The two discussed their testing situations. Karsten understood Ben's affinity for testing online, but made it clear that he actively enjoys the company and camaraderie of playing with a team of friends. Frank Karsten and Ben Stark are Hall of Famers with decorated histories face off in Round 7. Ben agreed and disagreed at the same time. "Yeah, I would much rather have a good time with people than try to calculate their value in testing," he said. "Still, I just like playing Magic Online." In the first game, Stark started on six cards and Karsten needed to go down to five. Stark led off with Inquisition of Kozilek and nabbed Signal Pest from Karsten's hand. Karsten had Arcbound Ravager on his second turn, and Stark used Lightning Bolt to kill it. Karsten was able to activate his Springleaf Drum to activate Inkmoth Nexus and keep the +1/+1 counter. 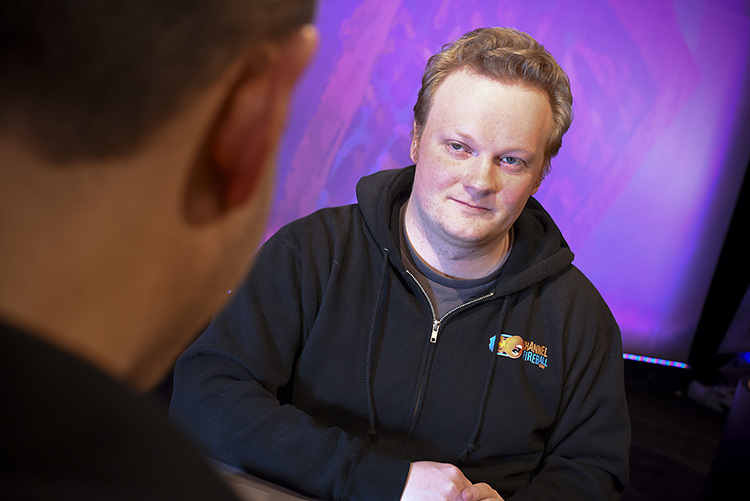 Another Inquisition of Kozilek from Stark left Karsten without any cards of note in hand. Karsten shrugged it off. He continued attacking with Inkmoth Nexus and played a freshly drawn Arcbound Ravager off the top of his deck. Stark had another pair of removal spells, but Karsten continued attacking with his remaining Inkmoth Nexus. Dark Confident seemed like the perfect card to come off the top of Stark's deck. Lingering Souls came next, and Stark looked to have found the necessary defense to overcome the Dutchman's virulent plans. Karsten, shockingly, chose Affinity for this Pro Tour. Karsten jumped through some hoops to make blue mana with Springleaf Drum by tapping a creature land to use Ensoul Artifact on his Springleaf Drum, but it didn't seem to stand up to Stark's growing resources. Another Dark Confidant came down for Stark, and Lingering Souls flooded the board with flying tokens. Fulminator Mage provided Stark with some play against Karsten's creature lands, and it was quickly used to dispatch of an animated Inkmoth Nexus. Karsten's 5/5 jumped in front of a Confidant and Stark was able to finish it off with Lightning Bolt, leaving Karsten with only a pair of Blinkmoth Nexus on the battlefield. Another draw step was enough for Karsten to pack it up and move on to a second game. Stark joked. "I didn't expect you to be playing Affinity," he said, obviously kidding given Karsten's reputation with the deck. Karsten laughed. "Didn't you play Affinity at the Block Constructed Pro Tour in 2004?" Stark smiled. "Yeah, that was my first Pro Tour Top 8. My team had the worst Affinity list imaginable. Your team found Æther Vial. My team found Scale and Tooth of Chiss-Goria." They both laughed. Karsten kept a slower opener than we often see out of Affinity and didn't have a play on his first turn. Stark led off with Inquisition of Kozilek. "It's not the best hand," lamented the Dutchman. "Yeah, but you don't really want to mulligan that against an attrition deck," Stark said. "No, I don't," Karsten deadpanned. Karsten's next turn was a bit better. Ornithopter off the top enabled a Mox Opal, which gave him enough mana to cast Master of Etherium. Stark thought long and hard before playing his land and using Terminate to get the new creature off the table. Karsten started poisoning Stark again, but Lingering Souls came next and the land plan was, once again, thwarted by the powerful flashback sorcery. Stark assembled his army of four spirits, while Karsten continued to draw lands. Stark made sure he was able to linger around in his games against Affinity. Karsten tried to line up an attack, but Stark's Lightning Bolt and lone defensive spirit left Karsten without any power on the board. Karsten failed to find any action, but Stark was only getting in for 1 damage a turn because of a pair of defensive Ornithopters. Fulminator Mage came down and hastened the clock. Karsten found Etched Champion and was able to, once again, slow Stark's plan to a crawl. Damnation cleaned things up and Stark started getting in with Shambling Vent while also padding his own life total. Sea Gate Wreckage threatened to allow Karsten to grind his way back into the game, but Stark had Zealous Persecution and a pair of burn spells to finish the game off.